Turn your machine into a demolition machine with this easy to use genuine Bobcat attachment. 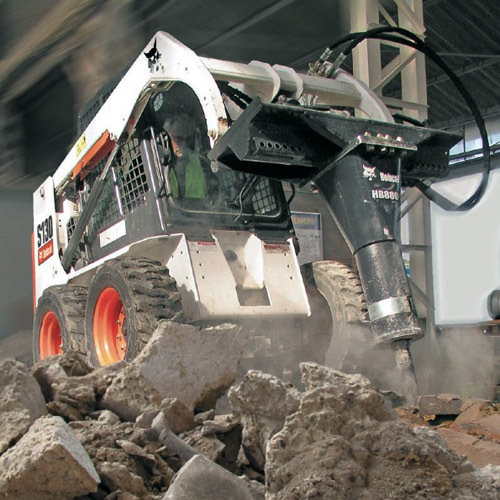 The hydraulic breaker shifts the hydraulic capacity of your machine’s carrier into the breaker attachment, allowing it to bust through the thickest concrete, break down the largest rock, and pound the asphalt harder than ever before, while providing the smoothest and quietest operation available on the market. Use the Bobcat hydraulic breaker to get through road repairs, interior or flatwork demolition, and even on demolition jobs that require a serious level of precision. This Bobcat genuine attachment part is here to help you power through it all. With a long list of features, including easy mounting, a special cylindrical breaker cradle that allows you gain access to confined spaces, minimal maintenance, an innovative steel-ring system, automatic pressure regulators, and so much more, this is one Bobcat product you won’t ever want to try working without. You can even customize your machine further by choosing from a range of breaker bits specially designed for your Bobcat hydraulic breaker attachment. Bobcat has built its reputation around innovation and high quality, and they promise only the best with all of their genuine parts and attachments. With added features, an extended warranty, and a level of service that can’t be beat, you don’t have to think twice when it comes to choosing Bobcat for all of your demolition needs.